Who and What Is an American? For your culminating assessment on the first unit, students will write an in-class essay that addresses the following prompt. 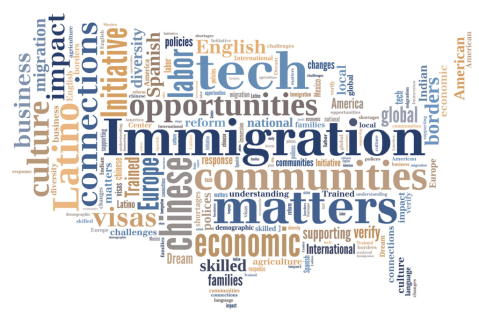 Explain who and what an American is by explaining the reasons (political, economic and social) and effects of immigration on the growth of America society. Your essay should include a multitude of historical evidence from the PowerPoint and your reading of the text. Essays that score the best will also include examples and citations from the supplementary readings. Supporting accurate illustrative historical details are relevant and provide important information about the prompt. A thesis is present. The writing has balance; the main idea stands out from the details. • The writer seems in control and develops the topic in a logical, organized way. The writing connects ideas to the specified purpose. The writer selects words that are accurate, specific, and appropriate for the specified purpose. • The writer uses a variety of sentence structures. The writing is readable, neat, and nearly error-free. A minimum of six different examples from the supplementary readings are cited and utilized effectively. The writer has defined but not thoroughly developed the prompt using accurate illustrative historical evidence. A thesis is present. Some supporting details are relevant but limited, or overly general, or less important. The writer makes general observations without using specific details or does not delineate the main idea from the details. The writer attempts to develop the topic in an organized way, but may falter in either logic or organization. The writer connects ideas with the specified topic implicitly rather than explicitly. The writer mostly selects words that are accurate, specific, and appropriate for the purpose of the writing. The writer uses simple but accurate sentence structures. The writing is mostly readable and neat. Errors in language usage, spelling, and mechanics do not impede communication. A minimum of four different examples from the supplementary readings are cited and utilized effectively. The writer has defined but not thoroughly developed the prompt; response may be unclear or sketchy or may read like a collection of thoughts from which no central idea emerges. A thesis is present. Supporting accurate illustrative historical details are minimal or irrelevant or no distinction is made between main ideas and details. The writer does not develop the topic in an organized way; response may be a list rather than a developed paragraph. Ideas are not connected to the specified purpose. The writer sometimes selects words that are not accurate, specific, or appropriate for the purpose of the writing. Writing may be choppy or repetitive. Portions of the writing are unreadable or messy; errors may impede communication in some portions of the response. A minimum of two different examples from the supplementary readings are cited and utilized effectively. The writer has not defined the prompt. No thesis is present. Supporting accurate illustrative historical details are used minimally. Organization is not evident; may be a brief list. Ideas are fragmented and unconnected with the specified purpose. Much of the writing is unreadable or messy. Word choice is inaccurate or there are many repetitions. The writer uses simple, repetitive sentence structures or many sentence fragments. No examples from the supplementary readings are cited and/or utilized effectively. The writer is off topic or the response fails to develop any meaningful connection to the prompt. No thesis is present. No accurate supporting illustrative details are given.